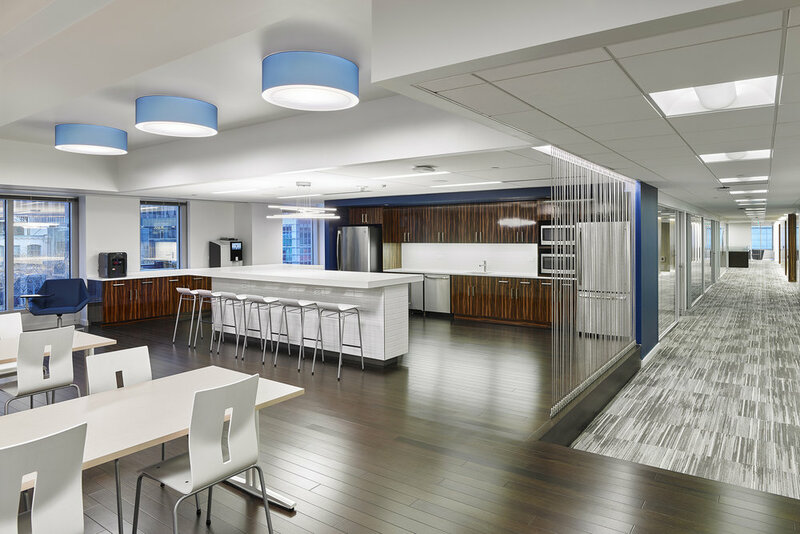 CDI Corporation’s commitment to innovation and creativity is communicated through the clean lines, bold colors and striking material palette on display throughout the company’s renovated Philadelphia office. 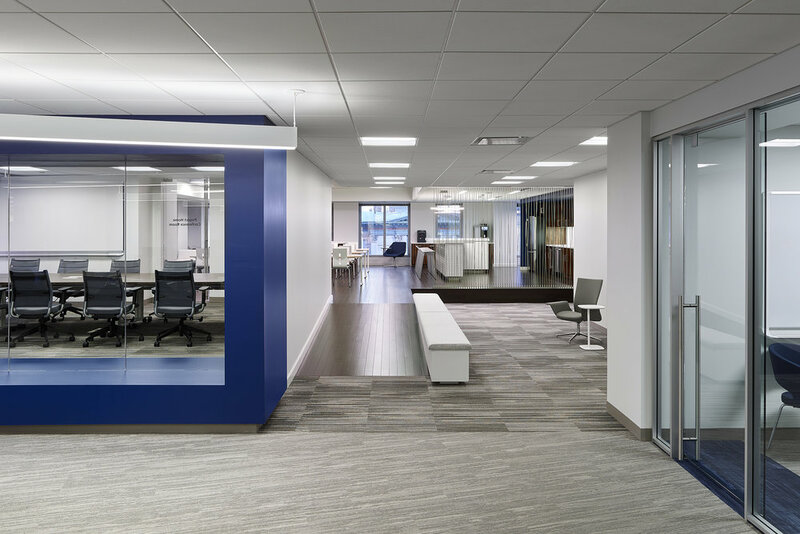 When engineering and technology firm CDI Corporation decided to refresh their space, they called on L2P to create a sleek, sophisticated environment reflective of the brand, its values and its expertise in the tech industry. 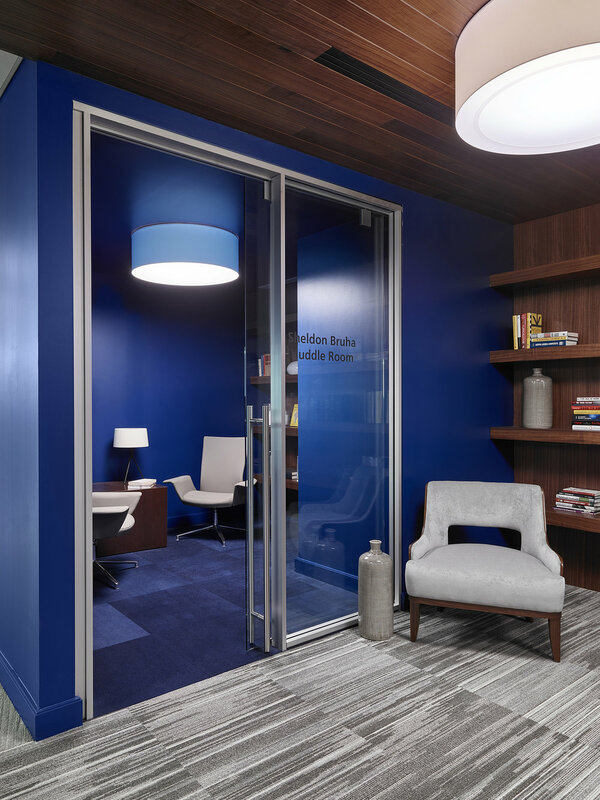 Crisp whites are offset by opulent wood tones, and bold pops of color—namely, the company’s signature royal blue—appear throughout the space to emphasize the brand’s identity and presence. Glass walls enclose offices and conferences rooms, allowing natural sunlight to illuminate every corner of the workplace. Open and closed collaborative spaces are located in each quadrant of the floor to encourage teamwork, learning and sharing. Employees and guests have access to cutting-edge technology at every turn thanks to a simple user interface located in each meeting space. The library provides an intimate and comfortable retreat space for meetings, with adjacent huddle rooms for private calls. Amenity areas include an elevated and centrally located hub space, which provides an open, accessible and flexible environment for meetings, dining, events and quick interactions. State-of-the art technology is accessible in all meeting spaces with simple user interface.